The Works of Charles Robert Maturin, a series containing his novels, plays, and sermons, seeks to present a reliable, freshly typeset, and judiciously annotated text of Maturin's works. The three plays of Charles Robert Maturin, produced in London between 1816 and 1819, document Maturin’s attempts at theatrical success. His first three novels were not popular, but his luck improved with Bertram (1816), which ran for twenty-two nights. Even with this success in hand, Manuel (1817) and Fredolfo (1819) failed completely, partly through the sabotage of indifferent actors and a fickle public. A posthumous play, Osmyn, the Renegade, had slightly better luck, but only fragments remain. The Works of Charles Maturin is available from Lulu.com and other on-line outlets. 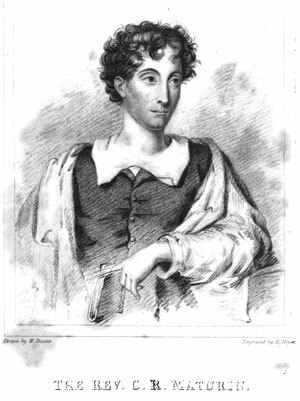 Charles Robert Maturin was born in Dublin in 1780, and died there in 1824. He was ordained in the Anglican Church of Ireland, and from 1805 until his death he was the curate of St. Peters in Dublin. He was the author of six novels, many incorporating, to varying degrees, elements of the gothic genre, the most famous of which is Melmoth the Wanderer (1820). He also wrote three plays, one of which, Bertram (1816), had success on the London stage; but otherwise his writing did not yield financial rewards. His meager church salary and eccentric, spendthrift habits ensured that he and his family (there were four small children when he died) remained in straightened circumstances, and his persistent and exhausting pursuit of literary success undermined his health, leading to his death at 44 years old.